This Dirt Bike cake was really pretty easy! 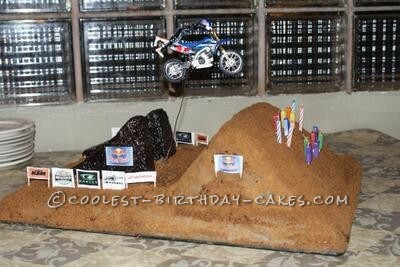 Just a bunch of cake mounded into a landing, rice crisp take off and a toy dirt bike held up by a coat hanger. The cake was white with butter cream frosting. I put Cocoa Krispies and Oreo’s in a food processor to make the “dirt”. Then just pressed it into a dirt colored butter cream frosting. Rice Krispy take off’s we drizzled in the Betty Crocker glaze (I added some black food coloring to it) after I lightly butter creamed them for extra smoothness. Finally, I went on line and printed some logos to make the banners.